So I was cleaning out my stash of watercolor paper, when I found a lovely full sheet of 300 lb. paper that I didn't even remember I had. I think I bought it many years ago from a person who was moving and just didn't want to pack it. I seldom buy 300 lb., since it is quite pricey, but it was in a batch she sold me. Probably never used it because it was such good quality paper and I didn't want to waste it. I needed to save it for something special to paint and of course I forgot I even had it. I decided that now was a good time to use it and it was so wonderful to work on. Even though it was old, the paint went on beautifully, just the way I wanted it to. With such heavy paper, I didn't even have to mount it. I have to say I was in my glory painting on it and I just went with what came into my mind as the paint flowed on through my brushes. 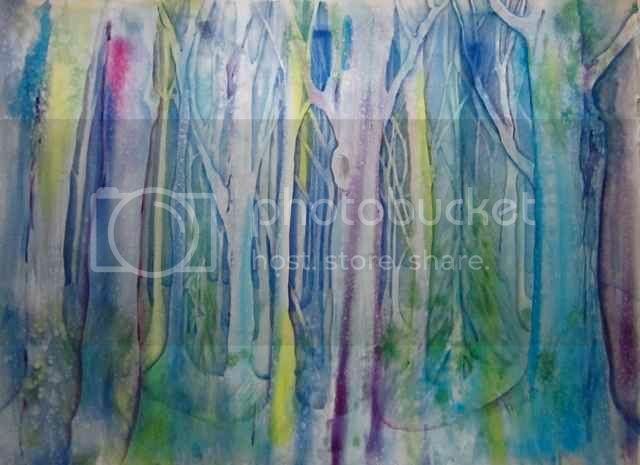 I call it "Silence in the Wood", and it is 22" x 30". I have matted it and have plans to frame it for the judged show coming up in the fall at the Mispillion Art Gallery.